I don’t really see the FAIL here. It’s a reference to the planned reconstruction of the train station in the german town of Stuttgart. The project is called “Stuttgart 21” and it’s very contoversial, even leading to riots – some might consider it “evil” or even as “all evil”. 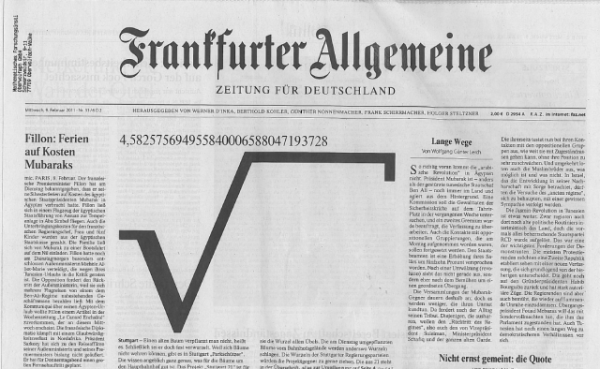 Then you just type sqrt(21) in your calculator and see what the headline and the image want to say. I don’t see the fail here. The comma used after the 4 (in place of a decimal point) is common for European countries. The digits given are correct for this approximation of the square root of 21.